Marie made a queen sized quilt for each of her children when they turned 21. These were the two boys quilts. Sadly her daughters quilt was unfinished when she died two years later and our group happily finished it for her 21st. Debby's first ever quilt on the right... fabulous! Some modern quilts by Andrea and Jennifer, the charity quilt and on the bed a quilt I made for my eldest son. At the exhibition we sewed together blocks for a quilt that we donated to a charity. Sewing away on the weekend was our beautiful Marie. Whenever a group quilt was being sewn for someone sick or a charity I could always rely on Marie to be there sewing non-stop until the project was complete. Some beauties there - and so varied - thanks for posting them all. The raffle quilt was gorgeous - and the lone stars too! Very pretty quilts! 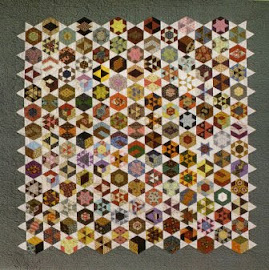 It is interesting to look at past pictures of quilts. I love a good show with a diverse collection of styles and colors. Thanks for the memories!! I remember that lovely show, and how hard you all worked to get it together. Such a wonderful quilt show - Mum and I remember it very fondly. We loved all of your SOUP shows, we had such a wonderful time. Hope you and yours are all well - we're all going swimmingly here. Hi Suzie and Kate, Those quilt Exhibitions were fun. It was always good to catch up with you when we had them. Hope you and your families are great as well. Your babies must be growing up I am sure!